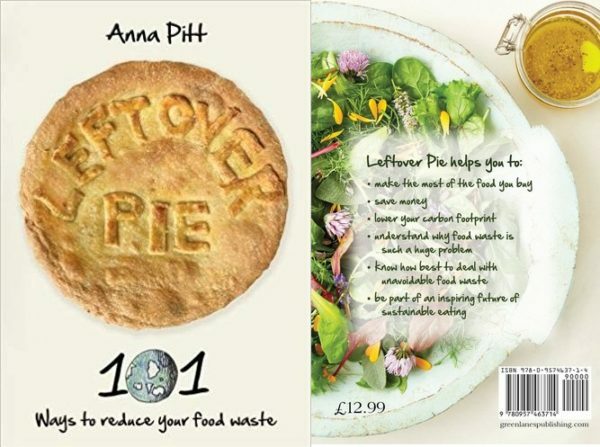 Aimed at teens and their families, Leftover Pie, by Anna Pitt, helps people to make the most of the food they buy, stop wasting money, lower their carbon footprint and understand why food waste is such a problem. Featuring recipes by chefs, bloggers and food waste champions, you’ll never waste food again! Buy the book from this site and get it signed by the author! Leftover Pie helps people understand why food waste is such an important issue. It shows we have reached a point in the history of food production where we need to rethink our path. To avoid the serious environmental problems of soil depletion, loss of biodiversity and climate change we have to make some changes. Leftover Pie shows that many people are already thinking about doing things a bit differently. While still creating and sharing wonderful meals they are really making the most of their food and making sure that they are getting best value from it, including gaining value from the food that might be overlooked as waste. By looking at the history, philosophy and psychology of food and food waste and providing inspiring solutions, Leftover Pie aims to encourage more people to make the change to a sustainable food future. Leftover Pie is aimed at teens and their families. The ideal reader is aged between 11 and 19 when they are starting to contribute to decision making about the food they buy and are more involved in the decisions that contribute to food being wasted. meet their carbon reduction targets. as well as helping schools save money by cutting down on waste. This is a book to inspire and motivate you to getting the most from your food. The benefits are far and wide for both your bank balance and our future generations. This book takes it to another level! The information here is both fascinating and helpful whilst also being academically researched. It is thought provoking but doesn’t leave you feeling guilty and worried. I’ll be recycling some of the many cook books I never use, this one has it all covered! It should be essential reading for anyone who is committed to reducing food waste. I feel like an expert on food waste after reading this book.